Our 1911 rating system here at Gun Nuts has a considerable amount of data fed into it from shooting competition and taking classes over the years. Thanks to that, I can actually compile a fairly comprehensive list of 1911s and the order in which we generally recommend them to our readers. But instead of providing a group of tiers, I’m instead going to list major 1911 brands in no particular order with our combined observations and recommendations for them. If I miss a manufacturing that you’re wondering about, let me know in the comments. Colt: Look at your 1911. Does it say “Colt” on the slide? You’re probably good to go. Springfield: Look at your 1911. Does it say “Springfield” on the slide? You’re probably good to go. Nighthawk: The one Nighthawk we’ve had through the office was initially finicky with ammo, but after we sorted it out it was an unbelievable good gun to shoot. Wilson Combat: If money was no option, I’d get a Wilson. I’ve seen quite a few Wilson built guns at matches and they just ran like a series of raped apes. Sig: I had a Sig that ran very well for a while. I have also seen other Sigs that…didn’t. Smith & Wesson: I feel the same way about S&W that I do about Springfield and Colt, they’re probably going to run just fine. You have a good chance with an S&W, I’ve seen plenty of S&W guns run awesome at matches. Ed Brown: I honestly have no opinion one way or the other. Taurus: True story – I once had a Taurus PT1911 turn into a machine gun. It was kind of rad and I’ve not shot a Taurus 1911 since. Kimber: Kimber started off with a reputation for quality that was just as good as Colt or Springfield; in the mid-2000s they took a turn for the worse. However, current samples that I’ve shot have been excellent, leading me to believe that Kimber is back and making legit guns. Rock Island/Armscor/other Filipino makes: As of this writing, we’ve had one RIA gun through the shop. It was a bare bones GI model in 9mm (I know, I know) but it worked, and worked very well. Remington: I have been generally impressed with the quality of the Remington guns. There isn’t a ton of data out there on them, but for the most part they seem solid. STI: It’s hard to quantify STI, because most of the STIs you see in the wild aren’t actually factory guns, but are gunsmith built on STI frames/parts. The only actual STI I ever owned was a 9mm Spartan, which is an Armscor frame, slide, and barrel with STI small parts. It was pretty rad. 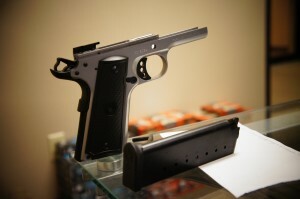 Para: I had a Para 9mm Commander that was the most improbably reliable gun I owned. I had a .40 S&W Para that wouldn’t reliably feed FMJ ammo. I had a Para LDA 45 Single Stack that was an LDA and just…not good. And now I have a fourth Para, this time a single stack .45 (possibly because I have a brain disorder). Dan Wesson 1911s: Not enough data to form an opinion, so we’ve requested one for review. Ruger: The new SR1911 from Ruger actually is building a pretty strong rep, and I’m interested to see how the gun shakes out. I’ve never seen one in the wild, but in general when Ruger makes a gun out of metal it’s a pretty good gun. That’s not to say that you can’t get a good gun from any one of the not recommended manufacturers, or that your Colt/Springfield/S&W isn’t going to have issues. But the odds are more in your favor if you do buy a Colt/Springfield/S&W. One thing I don’t address are full custom guns, which are available from quite a few different companies (some not listed), because with a full custom gun you get an entirely different experience. However, there are good gunmakers, and then there are…not. Even then, people make mistakes. One of the reasons I’m not super hot on full house custom guns is because unless I need a gun that shoots half an inch at 50 yards, there isn’t a lot I can do with a $4,000 hand built 1911 that I can’t do with a $1,000 Springfield Range Officer. Also, stop buying guns with full length guide rods. You’re making JMB sad.